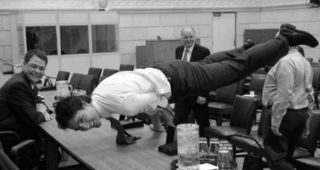 Canadian Prime Minister Justin Trudeau is Amazing at Yoga, and There's Proof! There are several reasons why the world is collectively crushing on Prime Minister extraordianaire Justin Trudeau, including the fact that his response, when asked why he made half his cabinet women, was, "because it's 2015", he was the first Canadian Prime Minister to march in the LGBT pride parade and looks adorable with baby pandas. Originally this was clicked in 2011 and posted online by freelance photographer Gregory Kolz in 2013, but this photo went viral when Toronto based yoga teacher David Gellianeau posted it on Facebook. Seriously, the 'Why Justin Trudeau is Basically Perfect' list just keeps getting longer.